It took me many years to figure out what skin care routine worked best for my skin. Many. MANY. Years. I've tried almost every cleaner and acne system you can buy and it felt like no matter how much money I've spent on products, I still battled with blemishes on my face and patches of dry skin. I bought into the dream that I could have clear skin like my favourite celebrities if I bought that $50 cleanser. Isn't it supposed to be that we pay for what we get?? Shouldn't expensive products work no matter what? I wasted a lot of time and money only to realize that those expensive products (in my case) DID. NOT. WORK. Nope, not even a little bit. 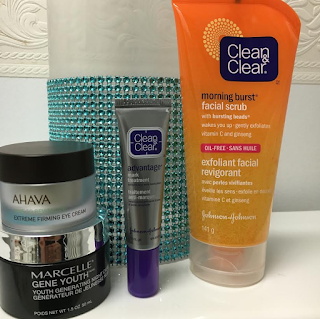 Just last year I tried a new combination: a mix of high and low end products that included a bit more pricey night cream (I never used night cream before) and cleanser that I haven't used since high school. Most of the time I try to take advantage of whatever deals are going on in store, and just my luck, the Clean & Clear facial scrub was on sale for about half price. BONUS! I was tired of spending tons of money on cleansers. It WAS taking away from my makeup budget after all! I was lucky enough to figure out this magical combination and I woke up every morning with the softest face I ever had. I seriously had to stop myself from stroking my cheeks while I was brushing my teeth! I love the way my face feels after using this scrub. It's very gentle and smells great. I know, I know...It's meant for the morning but I just love using it as part of my evening routine. This product contains tiny plastic microbeads called polyethylene beads. The scoop is, these little beads are not filtered properly during sewage treatment and have the potential to harm marine life (major booooooo!) As much as I love this product, I am currently on the hunt for something more eco-friendly. I was turned on to this product after finding it on sale (you know how much I love a good sale!) and am very satisfied with this product. It absorbs quickly and feels verrrry nice! My first experience with an eye cream and was gifted to me by my mother-in-law after her trip to Israel. I'm satisfied with this product however I am not convinced that it's a necessary step. This product has the same ingredients that are in regular moisturizers that can be used all over the face, leading me to believe it's just another facial moisturizer. I like this product because I can actually feel it working. This is both a good thing and bad thing. This product contains alcohol, and while I didn't experience any irritation with this product, someone with sensitive skin would not like this and might perceive the tingling sensation as burning. Combined with eating a healthier diet and drinking plenty of water, I have the best skin I've ever had. Most of the time I don't wear makeup but having blemish free skin makes it so much easier to apply makeup on the days that I do decide to put on a little glam! Let me know if you have an evening skin care routine. I'd love to hear from you!